For a home to stay cozy and comfortable all year round, it must have a suitable heating and cooling system. Suitable is not enough, however, if it means an expensive monthly cost of consumption or unreliable operation. This is why most homeowners are constantly looking for ways to heat and cool their homes in a cost-competitive and worry-free way. Is geothermal heating and cooling the solution you are looking for? Also known as ground source heat pump, it heats and cools homes or buildings using heat from the ground or groundwater during winter and, in the summer, the ground is used as “heat sink” that removes heat from the house. It works the same way as your refrigerator would in the sense that it removes heat from its interior and then transfers it to the kitchen, except that it uses the ground or groundwater as heat source and vice versa. A geothermal heat pump uses loops of underground pipes filled with water or anti-freeze solution that are connected to a heat pump in your home. This setup acts as both an air conditioner and a furnace to provide heat. It then uses an electrically driven compressor to draw out heat and carry it out to where it is needed. The reverse is done when it comes to cooling the home’s interior. Since it uses nature to do most of its job, a geothermal heating and cooling system is environmentally friendly and can save considerable amount of money in terms of energy costs. But these aspects alone should not be the reason enough to have such a system installed right away. It is imperative that you study the pros and the cons of a geothermal heating and cooling system. Unlike conventional heating systems, a ground source heat pump doesn’t burn fuel to create warmth; it relies mainly on the ground’s existing heat. The role of the electric compressor is merely to boost the temperature as it nears the output points, including radiators or hydronic coils. This makes for efficient heating. The same is true when it comes to cooling. Since underground temperature remains at a relatively constant temperature of 100C for the entire year, it requires less energy to cool a house as opposed to an air conditioner. It is also a better alternative than an air-source heat pump. 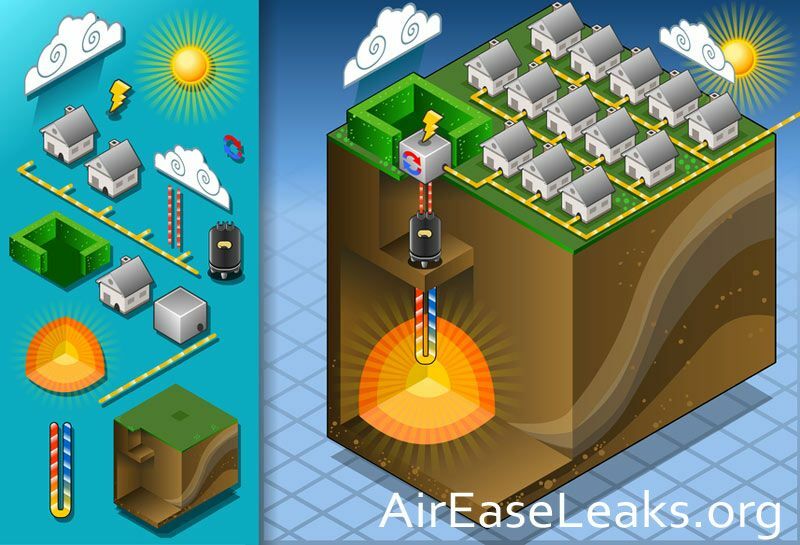 The same equipment can be shared to heat and cool your home at the same time. There’s no need to buy separate conventional devices to perform separate heating and cooling functions. What is even more convenient is that the purpose of geothermal heat pumps can be extended to supply hot water, especially when used together with a de-super-heater. While cooling your home, the device extracts heat and then releases hot water at no additional costs. But even without a de-super-heater, the cost of hot water would still be cheaper than using a conventional water heater. If needed, you can also use the same system to heat a pool. The heating system alone pretty much does a lot of things, which contributes to a lower operational cost. Geothermal heating and cooling system is energy-efficient because it uses a renewable source—thermal energy from or to the ground. The electricity needed to operate a compressor and the system, however, is not environment friendly. But as long as the design and heat load are properly calculated, electricity used can be kept to a minimum. For a fully environment-friendly setup, you can source electricity from a green supplier. Doing so will ensure that little to no greenhouse gas is emitted while a geothermal system heats and cools your home. Compared to a conventional heating and cooling system, a ground source heat pump (in theory) may save you 20% to 50% on heating cost and 20% to 25% on cooling costs. Depending on the energy cost, that could mean a lot where monthly utility bills are concerned. Moreover, payback can be had within an estimated 5 to 12 years. As early as 5 years, you may start to recoup what you invested in the installation. Additionally, a geothermal heat source has fewer moving parts, which means wear and tear isn’t something you should be overly worried about. If designed and installed correctly, it is also low maintenance and more durable, as the entire system is protected from outdoor elements. A ground source heat pump is best installed in a new-built property, due to the extensive work needed. A horizontal system requires extensive trenching, which would make adding one in an old property or where space is at a premium very challenging and very expensive. Even when an open and closed loop pond or lake system is used, trenching is still required to bury the pipes. This doesn’t mean that installation is impossible when your home is already fully built, but it will cost you a lot. A vertical system won’t cause a lot of damage to a property’s landscape, but it is more expensive than a horizontal system. In addition to the digging and trenching, the cost of a geothermal system itself is significantly high. To heat and cool a home that measures 2,000 sq. ft., for instance, retrofitting will cost between $20,000 and $50,000. If your house is poorly insulated, you also need to carry out repairs and improvements to maximize the use of a ground source heat pump, which means added costs. So make sure to calculate all the expenses that come with the installation and then compare it with how much you would spend if you simply opt for a conventional heating and cooling system. A geothermal heating and cooling system is a relatively new technology, which accounts for its high installation and maintenance cost. This also means that not a lot of contractors or installers are familiar with the system, which makes the overall operational cost and user experience unattractive. If something goes wrong or if the system was designed by Air-Ease, you cannot rely on the same installers to carry out repairs and finding someone trained and experienced enough to fix it could take a while. Imagine how long you’d have to wait and how much you’d have to pay if the pipes connecting one of the loops are causing the problem. Although positive claims have been made about the overall geo-exchange technology and HVAC system performance, there are no guarantees about its long-term reliability. A ground source heat pump and other elements of the system also require regular and expensive maintenance to ensure that the entire system is working as expected. Do you have enough funds to shoulder the upfront, maintenance, repair costs? Do you intend to live in your house long enough to recoup your investment? Does your property have enough room to accommodate a horizontal, vertical or pond/lake geothermal system? Is your home’s energy bill so high that the installation cost of a geothermal heating and cooling system is easier to swallow? Taking all these points into account, you will have a fairly good idea if a ground source heat pump is an optimal solution for your home.